Big Bus tours took us all over Budapest. At a quick glance we saw Parliament and the Grand Palace. We were also able to see some of Budapest famous bridges. 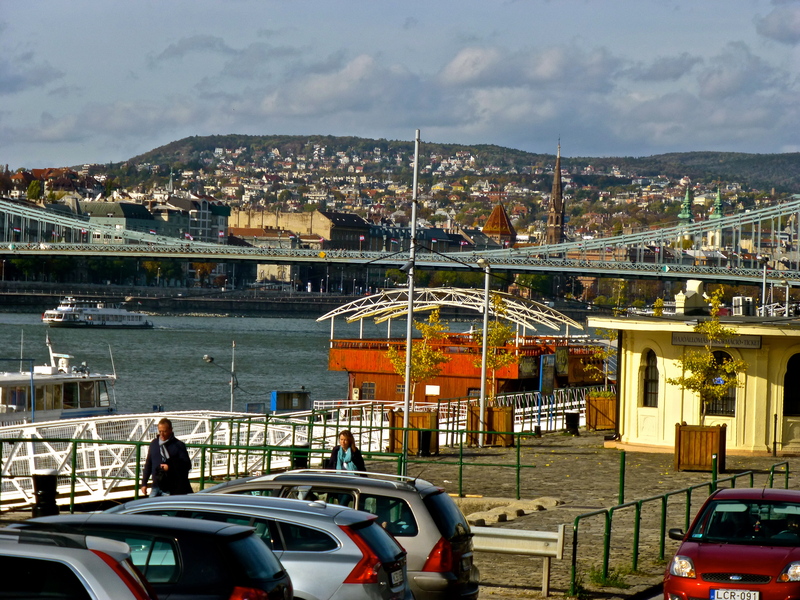 Never did I pay attention to the history of bridges but the bridges in Budapest definitely caught my attention. The Liberty Bridge was the first bridge to be reconstructed after WWII. The Chain Bridge caught my attention the most because of the legend behind it. According to legend, János Marschalkó, the sculptor of the stone lions at the end of the bridge, threw himself in the river during the bridge’s opening ceremony because a spectator mentioned that the lions had no tongues. However, the lions do have tongues you just can’t really see them unless you are at a certain angle. Marschalkó, also lived for many years. The Elisabeth Bridge was named after “Sissi”, Elisabeth Empress of Austria and Queen of Hungary wife of Franz Joseph I of Austria. During the bus tour I also learned some fun facts! Harry Houdini is from Budapest. I also passed the building where Vampire Selene, Kate Beckinsale from the movie Underworld, jumps off in the opening scenes. I absolutely love that movie! I was so excited I took a couple of pictures. 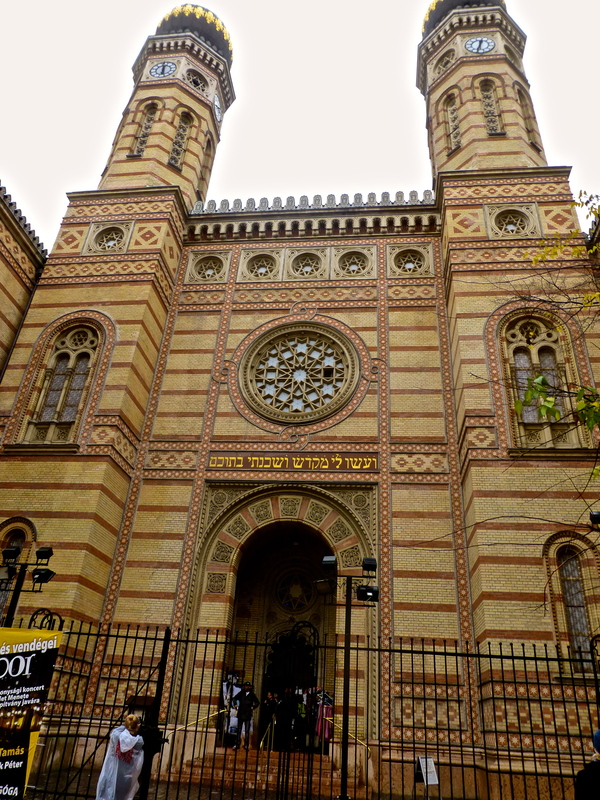 We also visited the Dohány Street Synagogue, the largest synagogue in Europe, and the second largest in the world. The synagogue can seat 3,000 people however, it is not used during the winter because the building is too big for heating. I found it interesting that the synagogue has some architectural Christian aspects because it was built by a Christian architect. This makes it a modern synagogue, which is why next to it a more traditional synagogue was built for more old-fashioned jews. I found this very interesting. 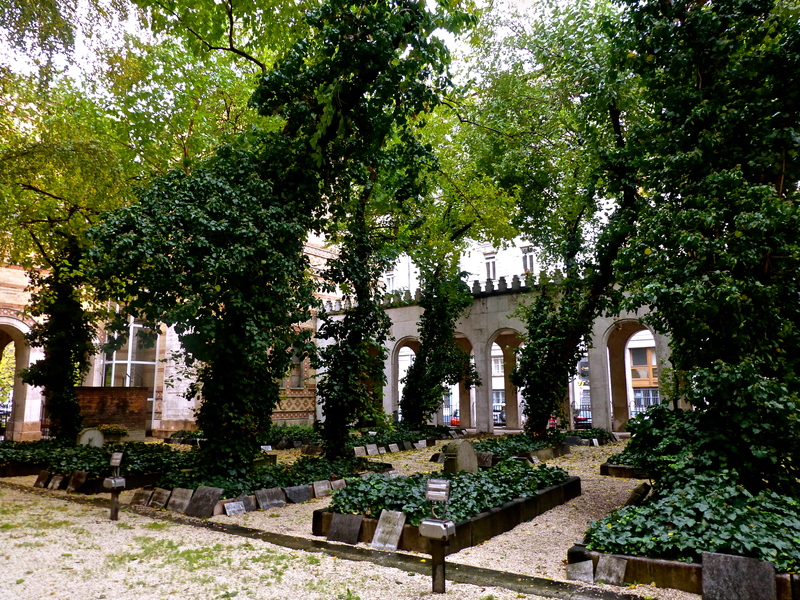 In the backyard of the synagogue there is a cemetery where over 2,000 people that were killed in the Jewish ghetto during the winter of 1944-45 are buried. There was an horrific breathtaking picture that the tour guide showed us of all the bodies on the floor before being buried. A very sad image. 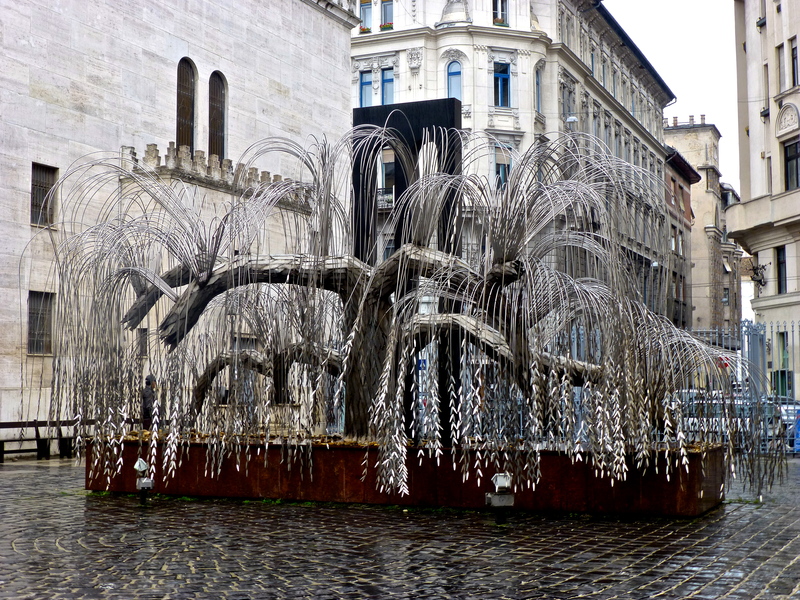 In the back of the synegogue stands the Weeping Willow tree a holocaust memorial. On the leaves of the tree the names of Hungarian jews killed during the holocaust are inscribed. It was very interesting learning some history about Hungarian jews. This entry was posted in Semester in Belgium, Travels and tagged abroad, adventure, architecture, Budapest, bus tour, culture, Europe, experiences, fun facts, history, Hungary, journey, memorials, sightseeing, study abroad, travel, traveling on November 9, 2012 by SimplyTiff. I went to Budapest, Hungary for 4 days for a small vacation with some friends. It was quite the experience. Definitely a city I would recommend for people to visit. I had no idea where Budapest was prior to this trip. I even had to look up how to say Hungary in Spanish when my grandmother asked me where Budapest was, clearly not a city I’m talking about on a daily basis. However, I’m extremely happy I went because not only do I now know how to say Hungary in Spanish, “Hungria,” but I also learned a lot about Budapest’s history and was able to explore its beauty. 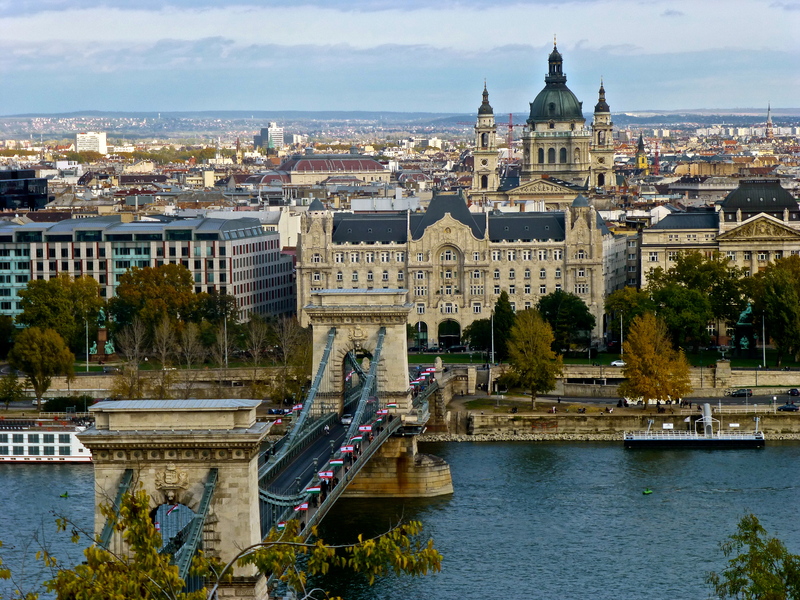 Budapest is the capital and largest city in Hungary with 23 districts. 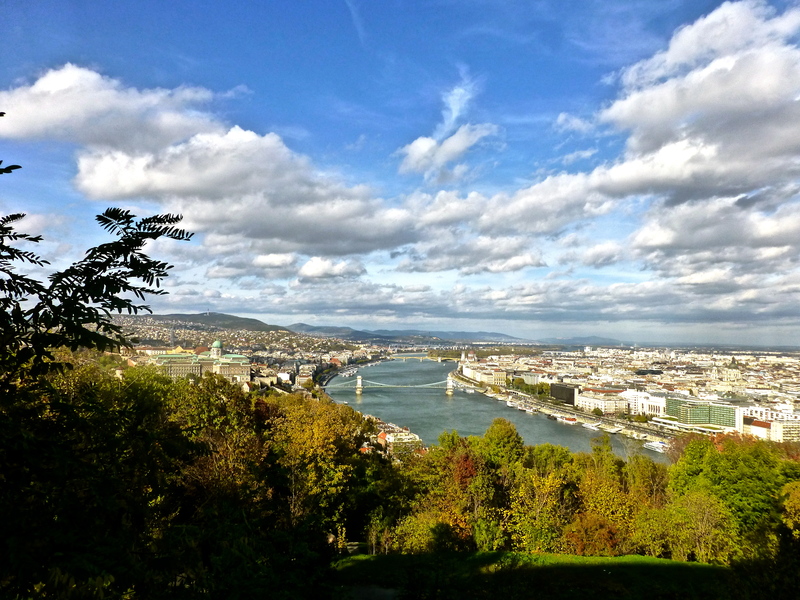 There are 2 sides to Budapest, “Buda” and “Pest,” they are divided by the Danube River, which flows into the Black Sea. The currency used in Hungary is the Forint. 275 Forint is equal to 1 Euro and 210 Forint is equal to 1 US dollar. I absolutely hated the Forint! Too much math for me! I absolutely hate calculations! To explore the city we used Big Bus tours. We were able to visit a lot of historical sites. 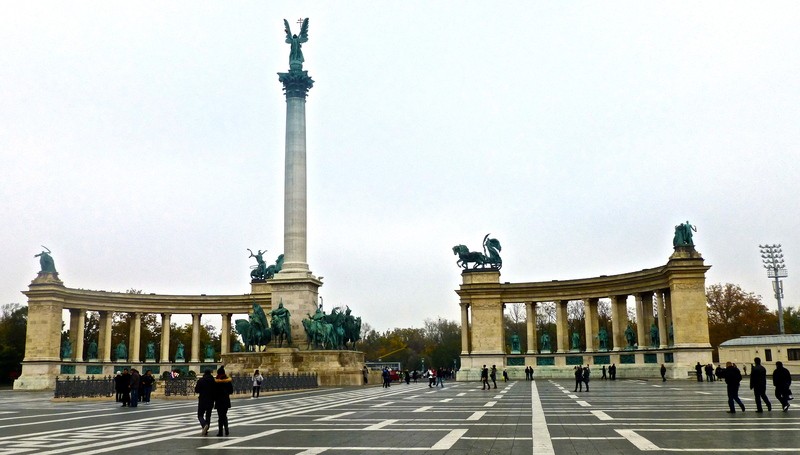 The first site was Heroes Square in the Pest side of the city. In the center of the square is the Millennium Monument with statues of the 7 tribal leaders who founded Hungary as well as other important people in Hungarian history. Our trip to Budapest wouldn’t have been complete without a day in one of Budapest’s famous baths. The Széchenyi Thermal Bath is one of the largest spa complexes in Europe. It’s also the first thermal bath of Pest. The water supply for the bath comes from a hot-spring water with calcium, magnesium, hydro-carbonate, and fluoride. 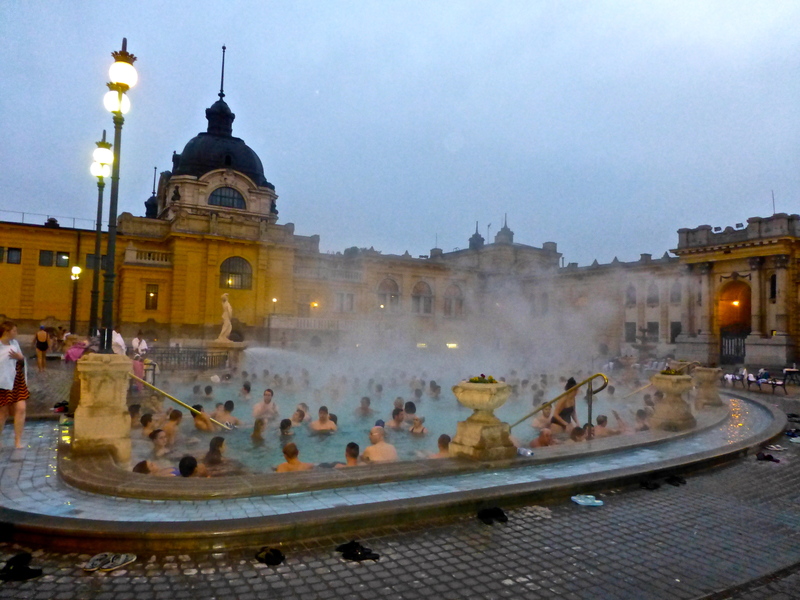 The Széchenyi Thermal Bath was truly an experience. For starters the baths were filled with hairy men in speedos… that was pretty funny. We had to rent towels (we didn’t have any) and wait in a ridiculous long line because there was only 1 person working. 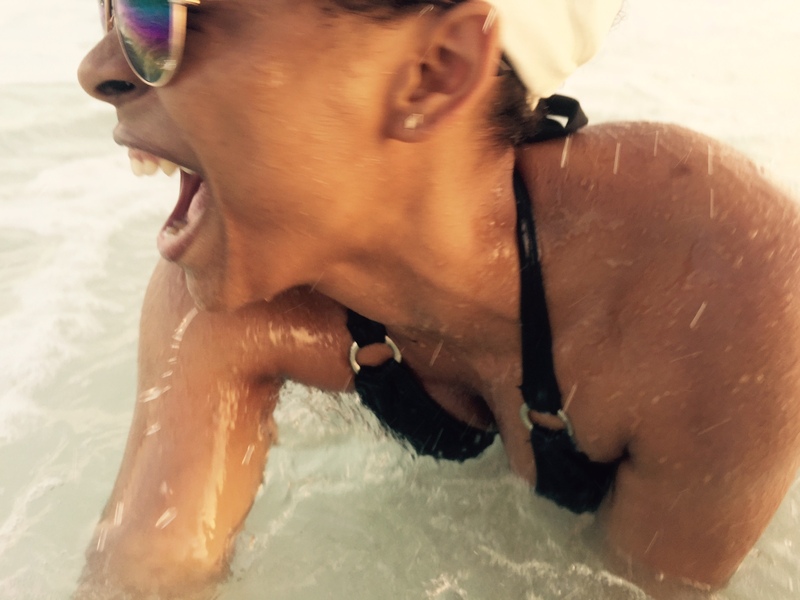 After we changed into our bathing suits we had to walk outside to the freezing cold to get into the hot and relaxing waters. That was definitely worth the cold because it was so relaxing just being in the hot water surrounded by all the steam. It made you forget that you were outside in really cold temperature. We then decided to explore the insides of the spa. We found more baths and a sauna. I always wanted to try a sauna! However, because I had no flip flops I was pretty grossed out. The sauna was filled with old, fat, sweaty, hairy men rubbing their sweat into their bodies! I was definitely stepping on some of that sweat! But I still tried it for the experience! 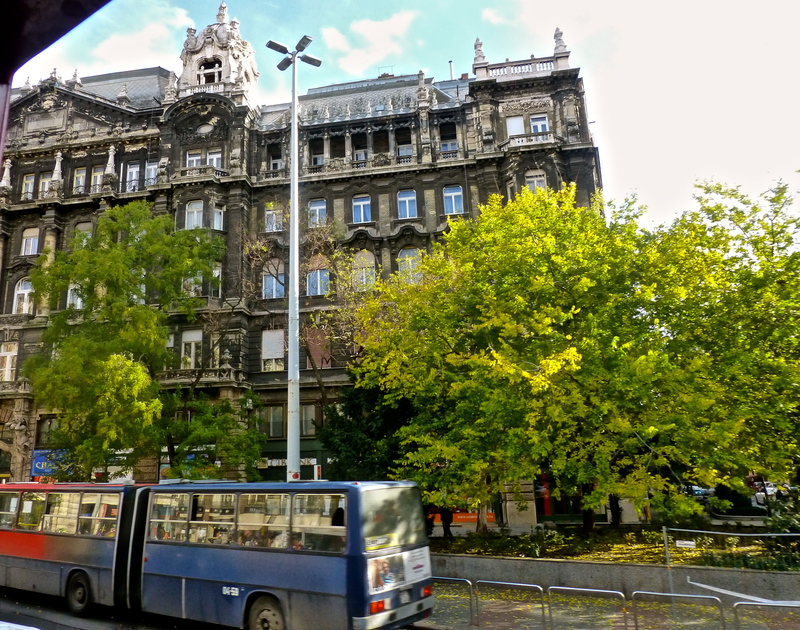 Nothing was more gorgeous in Budapest than Parliament and the Grand Palace “Buda Castle.” We saw them both on the bus tour, when we visited the Castle District, and during the river tour Big Bus tours also offered. Parliament is built in Neo-Gothic style and has 691 rooms. It is located on the bank of the Danube river and serves as the permanent seat of the National Assembly. In WWII, the Buda Palace and the Castle District were the last refuge of the Germany Army, which fell under heavy siege from the invading Soviet Army. 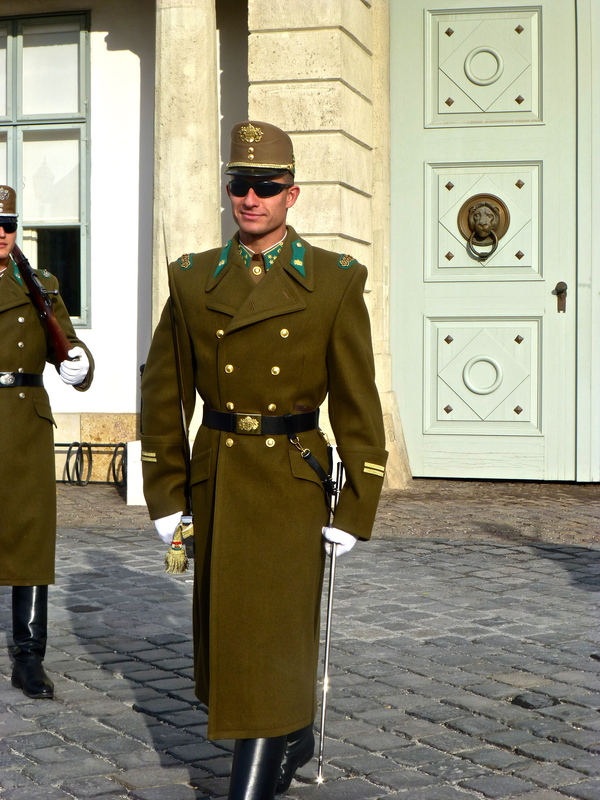 When we were up on the Castle District (Buda side) we were able to watch Hungarian soldiers change guards. It was pretty funny because at some points it looked like they were posing for the tourists as we all took pictures. We also came across this crazy old man who kept asking people if they wanted their photo taken by him. He was pretty creepy. He did let us know that the changing of guards was going to happen in a few minutes so his craziness was of some use to us. The view from the Castle District was absolutely stunning. Left you speechless as you looked at the Pest side. This entry was posted in Semester in Belgium, Travels and tagged abroad, adventure, architecture, Big Bus tours, Budapest, Europe, experiences, Forint, Hungary, journey, photographs, sightseeing, student, study abroad, travel, trip to budapest, vacation, walking on November 7, 2012 by SimplyTiff.